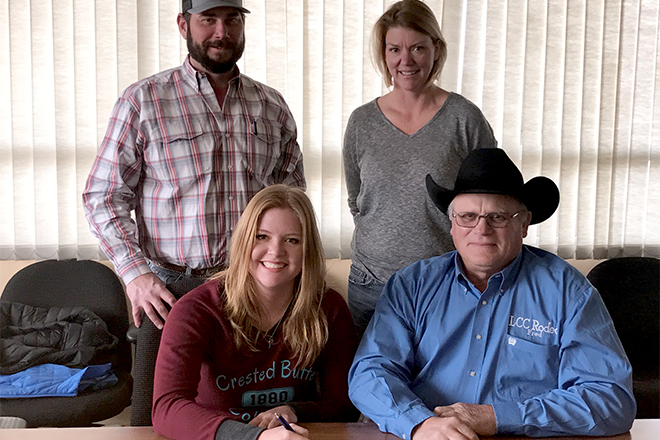 Joei Hamill of Lubbock, Texas, recently signed her Letter of Intent to rodeo at Lamar Community College this fall. The recent graduate of Frenship High School in Wolfforth, will add her goat tying and breakaway roping skills to the 2018-2019 Lopes Rodeo team. Hamill is finishing an impressive year, as noted by LCC Head Coach Fred Sherwood. "Joei is in eighth place in Texas Region 2 goat tying and is headed to the Texas State High School Finals in June," he said. "She also ropes very well and should make an immediate impact on our women's team." In addition to joining the Rodeo team, Hamill will pursue degree in Horse Training and Management this fall.